Nestled away in the town of Hallstatt in Austria, is the Church of Saint Michael. Built against the steep cliffs, and overlooking the beautiful town and lake, it is not the churches views that makes itsuch a draw for tourists, but rather it is what can be found underground. On entering the small chapel in the basement of the main church, one is taken aback by the hundreds of skulls on display. Whereas many such places exist throughout Europe, the skulls on display here (though not entirely unique) are largely hand-decorated. Lined up on rows of wooden shelving, some stacked several high; the skulls are almost more a thing of art than a record of life and death. Most bare the mark of the Maltese cross, many carry the names, professions and date of death of its owner, but it is the other hand painted details that make them really stand out – crowns of flowers for the women and girls, and wreaths of ivy for the men and boys. Rather than being a beautiful tribute to their dead, the painting of the skulls has another meaning – it is the equivalent of placing flowers on a grave. It was the gravedigger who would paint these decorations at the request of the family, for it was the gravedigger who would come into contact with their loved ones remains. This also leads us to the reason why there are so many skulls located in the bone house to begin with. Hallstatt is in a wonderful location amongst the cliffs of a forested mountain. As such there is not a whole lot of room for burial grounds, cemeteries and the like. With cremation being forbidden, in the 1700s room started running out for new burials. As such a tradition came about, where the dead would be exhumed about 10 or 15 years after their burial. 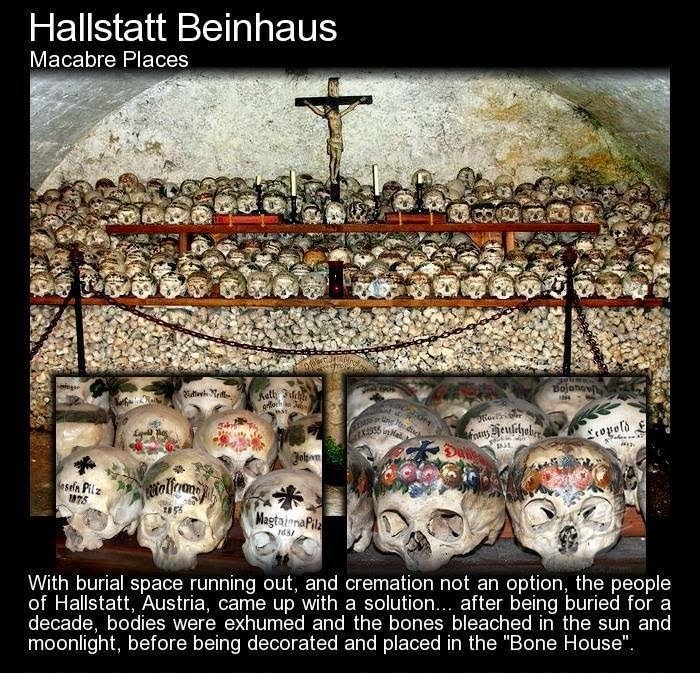 The skulls (and other large bones) would be left out to be bleached and cleansed by the sun and moon light. Once bleached an ivory white the bones would be given to family members who would place them amongst their other family dead in the bone house – whole families and communities are grouped together, their skulls now forming their memorials. Once placed, the family would then opt to have decorations painted on the skull. The tradition of decorating the skulls dates back to about 1720, with the last skull being interred in 1995 at the request of the deceased herself. The chapel is very still, being that it is underground, hewn from the rock, with the only light coming from candles and the little natural light that filters in from above. It is a solemn place and a fitting one for people to come and visit their ancestors.